The 2013 Sundance Film Festival is over and OUT! And for me and my road-trip partner, we couldn’t have picked a more opportune time to leave. The cloudless, sunny ski resort town we found when we arrived the first weekend gave way to wet, snowy weather the last half of the festival, by which time we were back in L.A. debriefing on our experiences, and for me, dealing with a persistent itching due to the very dry weather we encountered while there. News reports indicated that because of an inversion layer that clouded over Salt Lake City where I was staying the whole time, the air quality was pretty bad (unhealthy) for everyone all around. I’ve been back now, and I’m paying for it with redness on my arms and elbows, the likes of which I haven’t experienced before. And I hate it. A lot. Because I wasn’t here a long time (only four screening days in total), my screening schedule was very compressed into a little more than three days, during which I snuck in a mere dozen films. Oh sure, there were the films I made time to see in relationship to their being made by folks of Asian Pacific descent (A RIVER CHANGES COURSE; WHEN I WALK; LINSANITY; ANITA; PIT STOP) and works from different Asian countries that piqued my interest (JISEUL; METRO MANILA; SALMA; WAJMA – AN AFGHAN LOVE STORY; WHAT THEY DON’T TALK ABOUT WHEN THEY TALK ABOUT LOVE). There were other films that I made time for, just to see what non-Asian folks of color are doing (FRUITVALE was a favorite that I came around to late), while I was left to ponder the “what-ifs” of high-profile debuts that just missed the mark for me (Park Chan-wook’s STOKER, sabotaged by a lazy, error-laden screenplay). And for the brief time I ventured up the hill to sneak my way into Slamdance Film Festival offerings, I found myself well-rewarded, if distinctly sight-challenged for the uniquely ghetto-styled screening rooms built out of two motel banquet rooms. At the end of the day, the ability of our Asian Pacific communities to coalesce into its own “tribe” was a challenge, what with dispersed screenings and what seemed, to me, to be an apparent unwillingness for APA audiences to see beyond the flash of high-profile works as LINSANITY and STOKER and actively seek out substantial works that paint the fuller picture of our visions and voices. This was brought into sharp relief for me mid-week by an online follower who apparently was waiting with bated breath for my views on both STOKER and LINSANITY. I found it a bit dismaying that he contrasted my keen interest in noting the strong APA documentary presence this year against the excitement that attended the premieres of BETTER LUCK TOMORROW and FACE eleven years earlier, hinting that Asian Pacific American visions and voices have to go “mainstream” in order to find success and validation. I’m pretty sure he might not have MEANT that, but that’s how it SOUNDED. I suspect that he might not have been alone in his comments. In an environment that stokes mainstream Hollywood validation, the “buzz” around Sundance is heavily attended to narratives, while non-fiction works seem marginalized — this in spite of the heavy attendance I found for the documentary works I screened here. I know that. I get that. I see manifestations of that each and every year I come here to Park City. And it still leaves me shaking my head. Yet I see signs of this community coalescing around a recognized need to emerge from the crowd and recognize and support an Asian Pacific American film creative initiative. 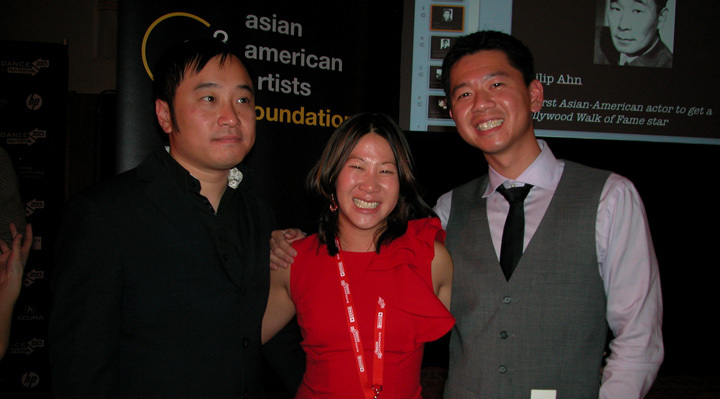 On Monday, my third day of screenings in Park City, I attend the official launch event of a new venture, the Asian American Artists Foundation, or A3 for short. Founded by a trio of early Facebook employees, A3’s goal is to diversify and support Asian American voices and faces in American media through television, film and online media. As a means of making their commitment real, the three founders announced a collaboration with the Sundance Institute to establish, according to the AngryAsianMan.com blogsite, “an A3 Sundance Institute Director/Screenwriter Fellowship to support a talented artist with an Asian American-themed project from among the Fellows selected by the prestigious Sundance Institute Feature Film Program Directing or Screenwriting Lab.” I’m happy to see an APA organization, even one so nascent, stepping up to the plate to put its money where its mouth is to nurture and support our communities’ storytellers. Given the youthfulness of the majority of the partygoers and the seemingly obvious disconnect from generations of past APA filmmaking pioneers, I wonder if this venture will produce talents that only speak to the YouTube-era denizens I saw littered around the room, and leave multiple other generations to watch the next level of growth from the sidelines. For now, I choose to defer that question to somewhere in the future when this initiative bears fruit. I choose instead to applaud this group of young entrepreneurs self-determined enough to put their money where their mouths are and support the making of new works BY us, ABOUT us and OF us. After the A3 Launch party, I head down the street to a party thrown by the Korean Film Council and Korean Cultural Center of Los Angeles to recognize works by Korean filmmakers playing at Sundance. It’s too bad that director Kim Tae-yong could not be in Park City to attend the screenings of his latest work, the short film YOU ARE MORE THAN BEAUTIFUL — I met him years earlier at the Vancouver International Film Festival when he presented PALE BLUE DOT, a wild short film co-directed with Min Kyu-dong, and the following year, their first feature film endeavor, the now-classic MEMENTO MORI. But other world-class directors were there to be honored, including O Meul (JISEUL) and the aforementioned Park Chan-wook (STOKER). KOFIC parties are known for good food (I kept wondering where on earth is there a Korean restaurant in Park City — good Asian eateries in this godforsaken resort town are few and far between) and the ability to bring diverse groupings of people together. The arrival later that evening of Korean American acting heartthrob Daniel Dae Kim made most everyone forget, if for a moment, the director of OLDBOY and SYMPATHY FOR MR. VENGEANCE was in the house. 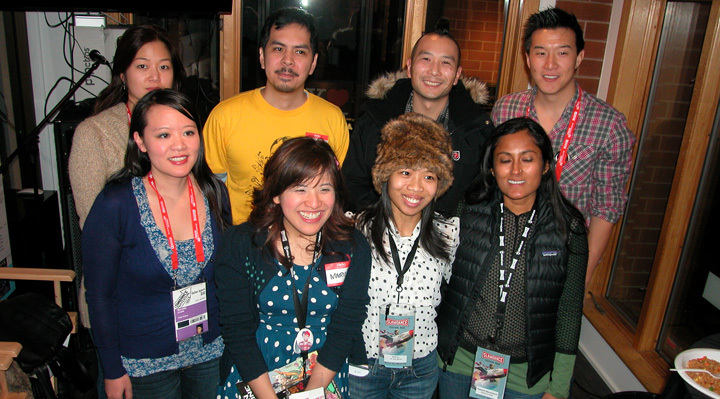 However, what I REALLY was in Park City for was the resurrection of a staple event that I’d been heavily involved with for the past nine years: the Asian Pacific Filmmakers Experience in Park City. Established in 2002 by folks from Visual Communications and David Magdael & Associates, the AP Filmmakers Experience recognized a whole generation of APA and Asian Pacific Canadian cinematic artists “on the verge” including Prashant Bhargava, David Chai, J.P. Chan, Yung Chang, Tanuj Chopra, Tze Chun, Lee Isaac Chung, Jason DaSilva, Ramona S. Diaz, Lixin Fan, Cary Fukunaga, Sonali Gulati, Vilsoni Hereniko, Kristy Kang, Michael Kang, Maryam Keshavarz, Gina Kim, Patty Kim, Krishna DK, Julia Kwan, Grace Lee, Iara Lee, Abraham Lim, Justin Lin, Liselle Mei, Tadashi Nakamura, Raj Nidimoru, Greg Pak, Bertha Bay-sa Pan, Betty Park, Jinoh Park, Jennifer Phang, Gene B. Rhee, Jessica Sanders, Mina Shum, Kim Spurlock, Kimi Takesue, Ham Tran, Shih-Ching Tsou, Alice Wu, Jessica Yu, and Eyad Zahra. This stellar list does not include well-established directors including Gregg Araki or Freida Lee Mock; nor producers who came of age during this time including Julie Asato, Karin Chien, Gina Kwon, In-ah Lee, Mynette Louie, or many others. Whew! What a roll call! The pain of not being able to pull together the AP Filmmakers Experience in 2011 and 2012 was not only painful for the organizations that helped organize the event — I also saw it as a condemnation of Sundance’s inability to consistently make a space for Asian Pacific American filmmaking talents in its line-up (which I understand is dependent on issues having nothing to do with race or inclusion, issues like filmmaking excellence. But I’m just sayin’…). So when the opportunity to celebrate a critical mass of new and emerging (and in some cases established) Asian Pacific filmmaking talent presented itself after perusing the announcement of Sundance invitees in early December, I jumped in with David Magdael’s office and former Sundance press office director Irene Cho and, with smoke and mirrors (not to mention some key assistance from Eseel Borlasa and Lansia Wann; volunteer help from Jo-Ann Wong and Matt Young; an 11th-hour food donation courtesy of Soo Chyung of local Park City eatery A Wok Away and sponsorship from Utah Multicultural Affairs; and the use of the Outdoor Retailer Innovation Gallery on Main Street, a hook-up made possible by publicist Henry Eschelman), we pulled together a modest but well-received party to recognize our Asian Pacific cinematic talents that packed nearly 200 Sundancers and Slamdancers into a compact 800-square-foot space looking down on Main Street, in the heart of Park City. Throughout the evening, I took note of how the event felt like a reunion of sorts: the garrulous Jeff Dowd, a producer who attended the first AP Filmmakers Experience event in 2002, was in full effect, as was alumni from past years as Greg Pak, in town to talk up a new mobile iPad app for his current passion as a well-regarded comic book author. Publicist Winston Emano, also an alumnus of that 2002 event, was here (as the publicist for LINSANITY), as was old stand-bys Lewis Tice, Linda Blackaby, and Mynette Louie. LINSANITY’s Evan Leong, a documentarian for the BETTER LUCK TOMORROW team in 2002, was finally here as a director in his own right in 2013. Director Jessica Sanders came to represent for her mother, Academy Award-winner Freida Lee Mock. I even noted some rising stars who, in 2002, were only thinking about filmmaking as a living, but are now “on the verge” of filmmaking notoriety of their own. Folks like producers Eugene Suen, Brian Yang, and Alan Lu. Folks like up-and-coming filmmaker like Nadine Truong who, after a career highlighted by a portfolio of well-regarded short films, is readying her first feature-length effort. Or even former AFI producing and editing fellow Soojin Chung, whose producing and editing work distinguished Park City’s most-buzzed-about selection, the hysterical ESCAPE FROM TOMORROW. And APA film fans like Franklyn Chien, Philip Fung, and Julia Lam who are electrifying the community through their launch of the Asian American Artists Foundation. They were all there to join with us — to celebrate and to give notice that Asian Pacific voices demanded a prominent place in Park City. As the party slowly wound down, with nobody willing or inclined to leave (a typical happening at past AP Filmmaker Experience parties), I felt a bit of loneliness for the absence of organizations such as Asian CineVision, the Center for Asian American Media, DC APA Film, and even the former San Diego Asian Film Foundation — organizations whose participation in past Experience events made the workload so much easier and additionally made for many bonding moments. For Visual Communications to reassert itself here in Park City as the nation’s premier APA media arts organization for a new generation of Sundancers and Slamdancers but to know that the other organizations were missing in action was somehow not right. I hope that this “critical mass” of Asian Pacific American organizational power returns in full force next year, along with another new crop of Asian Pacific American works to Park City.